We are St. Louis Wildlife, Inc. a full-service wildlife removal company servicing the greater Saint Louis MO area. We resolve conflicts with unwanted squirrels. When Can You Solve My Squirrel Problem? 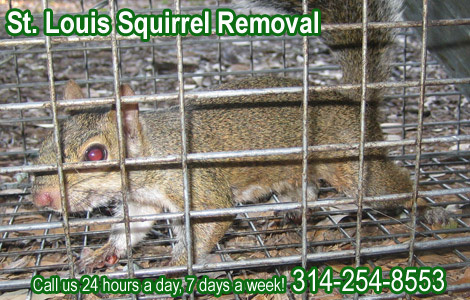 Our company specializes in wild animal control, including St. Louis squirrel removal. Common problems caused by squirrel include: living in an attic or the eaves of a house, falling down a chimney, digging or eating a garden, and chewing electrical wires. How Does An Attic Look To A Squirrel - After squirrels have moved into your attic, they have made it their home. Just as when you move into a new home, you rearrange your things to suit you; squirrels will do the same thing. They will prepare for the birth of their young with any material you have in the attic. If it is suitable and they need it, they will use it. Squirrels make themselves a comfortable place. Even though it is in your attic, they will still try to find a place that’s a little hidden. Squirrels will bury their food that they gather in the summer months. They will bury it outside in the dirt. During the meager months, they will dig outside in the hopes of finding some of their buried nuts and seeds. They will take them into your attic to eat, leaving nut shells and left-overs strewn around. After they eat, squirrels will relieve themselves and they are not fastidious about where they do their business. Your attic will be littered with all types of debris squirrels make and leave behind. Urine and feces from the squirrels will also give your attic a bad smell. After you get rid of them, there is a clean-up job waiting for you. You can read more about Getting Squirrels out of the Attic. Will Squirrel Poison Cause Squirrels To Die In The Home - Squirrel poison will not cause squirrels to die in the home. It will cause them to die but the location of where the squirrel dies will be up to the squirrel. There is one small caveat: If the squirrel is a mom with several young ones in your home, then she may actually return to them and die there. This is not a given fact, however. One of the things to consider when you poison a squirrel is what the squirrel will do after ingesting the poison. There is no specific squirrel poison as such, but many people use rat poison to poison squirrels. Most rat poison is a made of warfarin. This will cause the animal to bleed to death internally. Therefore, they will try to find water which will actually serve the home owner in his favor unless there is an open water source inside the house that the squirrel can use. If your method of poisoning squirrels is to set out a dish of antifreeze (which is not recommended) the squirrel will become disoriented and unstable on its feet. In this case, it may well decide to enter your home and find shelter to feel better. Wherever it decides to go in its last minutes of life is where it will die.